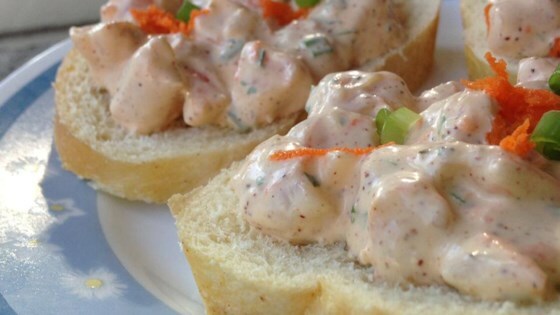 "Shrimp dip recipe with herbs and a hint of lemon." Add shrimp, green onions, onion, tarragon, parsley, rosemary, chili powder, and lemon juice to the jar of a blender or food processor; process the mixture until shrimp are finely chopped. Scrape the chopped shrimp mixture into a bowl and stir in the carrot, mayonnaise, and sour cream, mixing until well blended. Season to taste with salt and pepper. Chill at least 1 hour before serving. See how to make this crowd-pleasing seven-layer dip. I made this appetizer and it was a big hit. I used fresh herbs from my garden and served it with crudite. This was the best shrimp dip I've ever had! I substituted fat free sour cream for low fat, came out great!